Lakeville condo is city living by the lake. Experience all the possibilities of transformation and let them enrich your life. The Lakeside precinct together with the Jurong Gateway precinct form the 360 hectare Jurong Lake District. Get ready to grasp all the new opportunities at the Central Business District of the West and enjoy your access to Singapore largest regional centre. 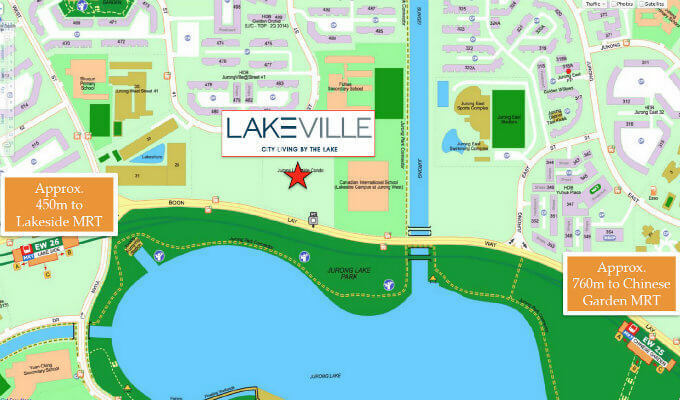 Discover Lakeville condo, the residence by the lake that gives you the best of both worlds. 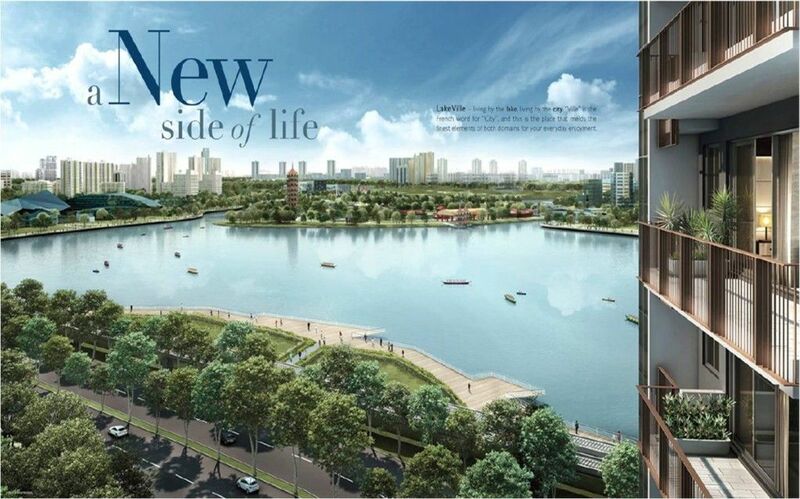 It draws out the best of city living at Jurong Gateway and it draws you into the embrace of nature by the lake. Welcome home to where you've always belonged. Be intimately acquainted with stunning natural beauty. Jurong Lake is your next door neighbour, and the Chinese and Japanese Gardens are its charming residents. Stroll along the 235m boardwalk and fishing deck, explore the waterfront park and promenade with exciting water activities, or try for a hole-in-one at Jurong Country Club. Take in a deep breath of endless summer, and get accustomed to spectacular lake vistas and an environment of serenity unique to this vantage point. Your home becomes your very own canvas for a living masterpiece, as the power of your imagination brings space to life. Make your selection from a wide variety of 1 to 5 bedrooms, dual-key and penthouse residences designed to cater to every need, boasting spacious and efficient layouts in a multitude of configurations. The highly functional private enclosed spaces, balconies and terraces have been thoughtfully positioned, allowing you to step out and take in the views. At LakeVille, you create the possibilities for stylish homemaking. From your well positioned home with two MRT stations at your doorstep, the journey will be short yet sweet, leading to a multitude of experiences. Shop till you drop at Westgate, JEM, and JCube. Explore the upcoming world class Science Centre, edutainment attractions as well as Lakeside Village with its shopping, dining, and entertainment offerings and boutique hotels. Just a stroll away are educational institutes like Canadian International School and Rulang Primary School. Savour authentic local delicacies and stock up on fresh food at the nearby markets and food centres. This is where all your cares end, and where life begins. Follow the waterway as it weaves a hundred metres through a series of glistening azure blue pools from the Starlight Dip Pool and Spa Coves, to the 50m Lap Pool, leading towards the Little Splash Pool and Rainbow Waterplay. Dine in comfort, under the Alfresco Sails, or simply relax in the Cloud Curls or dream in the Dreamweavers. You can also stay in the pink of health at the well-equipped gym and fitness stations, while your kids have a blast at the Orion Playland. Commanding a privileged position amidst a lovely location, residents of LakeVille can enjoy scenic beauty every day. For the majority of residences, simply opening the curtains will bring in panoramic views of Jurong Lake into the living space. This is a rare lake view enjoyed by few others in Singapore. 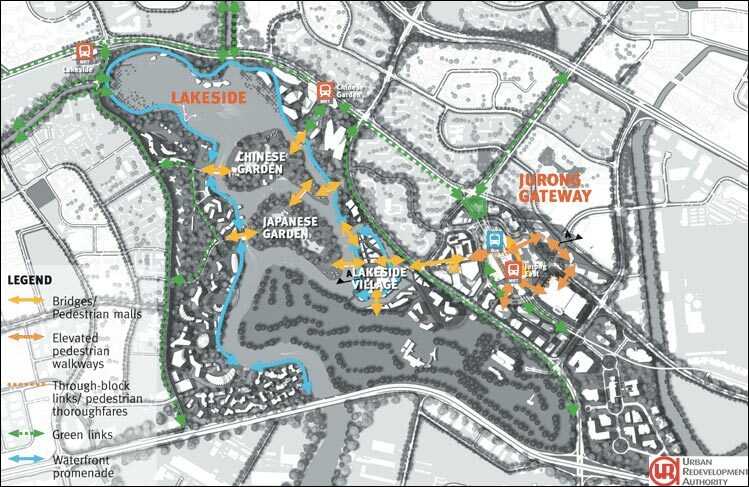 Urban Redevelopment Authority announces a master plan to transform area around Jurong Lake to become unique lakeside destination. 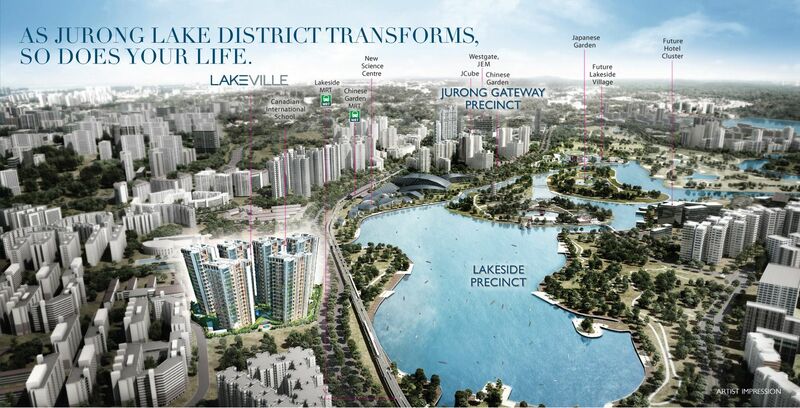 The 360 hectare Jurong Lake District will consist of two precincts Jurong Gateway and Lakeside. It is the largest commercial hub outside the Central Business District. New development around Jurong will include new waterfront park and promenade which will be developed next to Lakeside MRT station, new world class science centre which is next to Chinese Garden MRT station, Entertaining lakeside village, enhanced Chinese garden and Japanese garden. 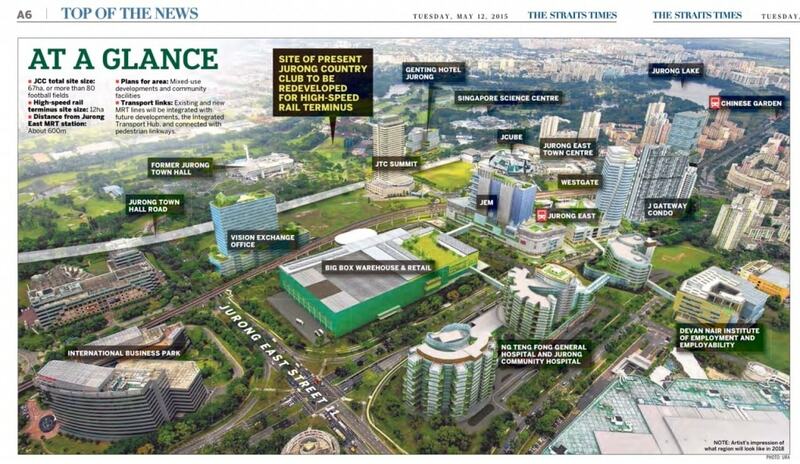 Jurong Gateway is an excellent mix of office, retail, residential, hotel, entertainment, F&B, and other complementary uses. An appealing environment for companies from the business services, science, technology sectors, and company headquarters. Jurong Gateway will consist of 500,000 square meters of office space, 250,000 square meters of retail, F&B, and entertainment, estimated 2800 hotel rooms cater to business travellers and to visitors of the leisure destinations around the lake and to create a live, work, play, and learn environment. Hotel in a garden by Genting Group. Extensive landscaping and greenery, roof gardens and sky terraces incorporated into the design of the "Hotel in a Garden". 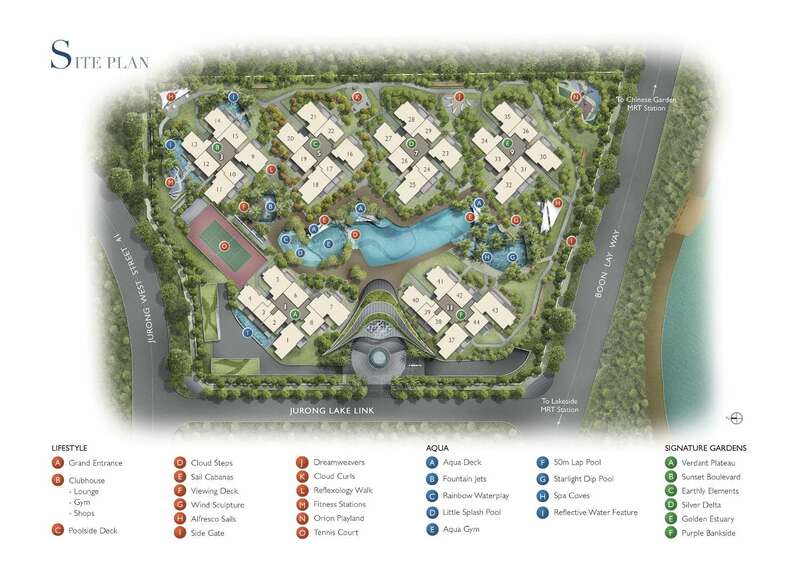 It brings Jurong Lake District residents incremental business, excellent convenience, and ample amenities. Jurong Lake Park will be redeveloped as a destination park, leveraging on its extensive waterfront promenade, residents will enjoy a variety of recreational options offered in three zones. The family zone will comprise play spaces for children of all ages, the adventure zone will offer an "island-hopping" experience, the nature green zone will preserve the natural habitats and their rich biodiversity. Shop and dine @ Lakeside Village and experience new shopping, dining, entertainment, and boutique hotels by the waterfront. New world class science centre and new edutainment pursuits in lakeside. Get set for 4 to 5 new edutainment attractions around the lake. These attractions will allow families with young children to play and learn at the same time. Jurong Park Connector - Lakeside creates a linear pathway lined with greenery for cyclists, joggers and even strollers with ample distances and breathtaking sceneries. The 20KM Hurong Region Line will connect the region to the existing rail network for faster travel to the rest of the island. It will serve residents of Choa Chu Kang, Boon Lay and the future developments in Tengah area. 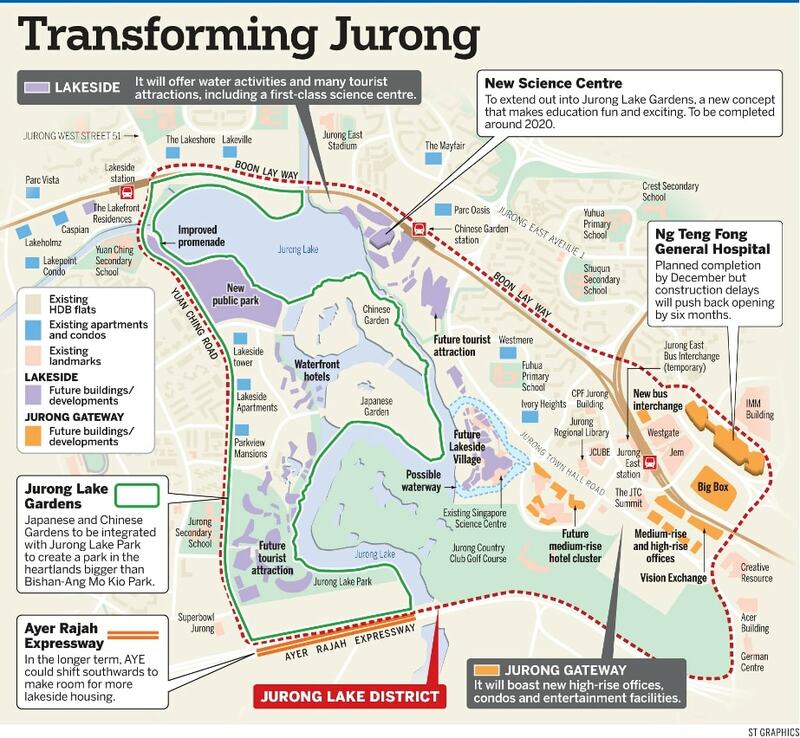 It will connect to main activity nodes in Jurong West such as Nanyang Technological University (NTU), The Jurong Industrial estate, including Jurong Island and the future Jurong Gateway commuters in the North will also be able to enter the Jurong region directly via the JRL without having to interchange at the heavily used Jurong East Interchange. Posted in Singapore and tagged condo in jurong, Lakeville condo, mcl land.